HardOCP noticed AMD revealed an updated APU and discrete graphics card roadmap at the company's Financial Analyst Day. A little bit of new news was shared with HardOCP this morning at Financial Analyst Day here in Sunnyvale, CA. You will notice two new System On Chip architectures, code named Kabini and Temash. 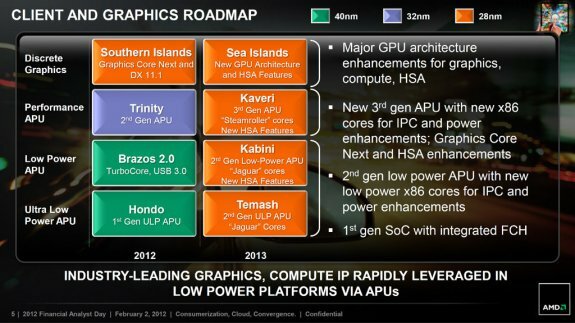 While that is not terribly exciting, what is exciting is seeing AMD's next generation Sea Islands GPU architecture. No information was given beyond the code name, and the expected debut in 2013.